It’s one thing to visit wine country, it’s another to immerse yourself in it. Staying onsite at a working vineyard is the perfect way to do just that. Let us know in the comments if you have other recommendations for other winery hotels and resorts. Cheers! Wine country in Alaska. Yes! Bear Creek Winery is one to check out and its lodging options provide guests with the chance to stay among the vines. 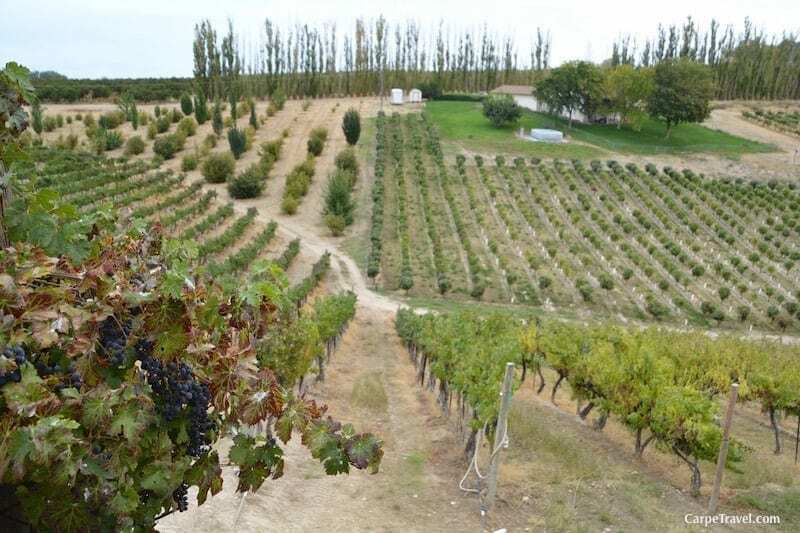 The winery is known its fruit wines and fruit grape wine blends. Château Élan is a 3,500-acre winery and resort in the hills of north Georgia, it is the first winery of its kind in the region since Prohibition. This award winning winery is just 30 minutes north of Atlanta, offering locals and visitors to Georgia a unique wine country experience, complete with wine tastings at its winery, four golf courses, eight restaurants, European-style health spa, a wine market, equestrian show center and tennis center. We’re ALMOST cheating by listing the Wine Country Inn in Colorado’s wine region, the Palisades. This winery hotel is not owned and operated by a vineyard, but the Victorian style hotel sits in the middle of 21 acres of vines that produce grapes, which are crushed and bottled as the Inn’s signature label wines. And, it is adjacent to two wineries. 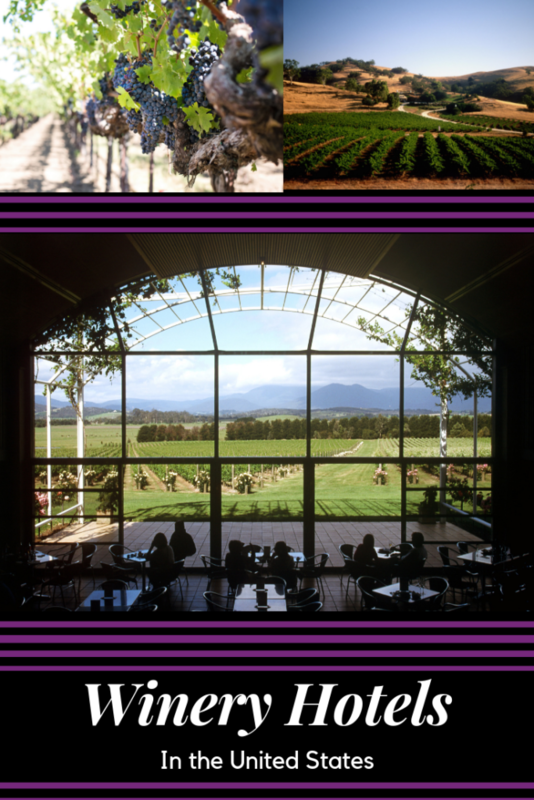 So, it can still be deemed as a winery hotel…at least according to us. The Bed & Breakfast at Bitner Vineyards is in the heart of the Snake River Valley. The B&B offers guests a tranquil oasis overlooking the beautiful Bitner vineyards. Exit through your bedroom’s French doors onto your personal patio and enjoy the gorgeous natural landscape! A stay at this unique venue in the heart of Idaho Wine Country includes a continental breakfast, a 10% discount on all wine purchases, and a $20 gift certificate to The Orchard House restaurant. There aren’t a lot of opportunities to sleep among the vines in Idaho’s up and coming wine region – yet. This winery hotel is a must if you’re looking for the full experience in Idaho. Need more on the Idaho Wine Country? See Carpe Travel’s Idaho Wine Travel Guide. Glenora Wine Cellars opened its doors in 1977 as the first winery on Seneca Lake and has been producing award-winning wine ever since. The winery is also home to the Inn at Glenora Wine Cellars, a unique winery resort in the Finger Lakes. Each of its 30 rooms feature a private patio or balcony that overlook vineyards and Seneca Lake. For a more secluded stay, book the two-bedroom Vineyard Cottage located alongside the vineyards. Overnight stays include a glass of sparkling wine at check-in, a bottle of the properties own wine – Glenora Wine Cellars, plus complimentary wine tastings at the winery. Beyond wine, you can enjoy regional cuisine featuring seasonal, locally-sourced menus at Veraisons Restaurant, located at the Inn. Overlooking Seneca Lake in the Finger Lakes region, Belhurst Castle is home to the Belhurst Winery. Built in the 1800’s as a private residence, now turned luxury wine resort, the property does an exquisite job blending 19th century charm with cozy, modern-day comfort. The historic castle still hones its original beamed cathedral ceilings, mosaic tiled fireplaces, and period décor helping you feel as if you’ve taken a step back in time. You can begin your wine tasting upon arrival by heading to the free-flowing wine tap located in the lobby or booking a tasting at the hotel’s winery. For dinner, take part in a wine and dinner pairing at Edgar’s Steakhouse. If you’re looking for a more casual setting, head to Stonecutter’s inside the castle. Make sure to visit the Isabella Spa-Salon for a little indulgent pampering. 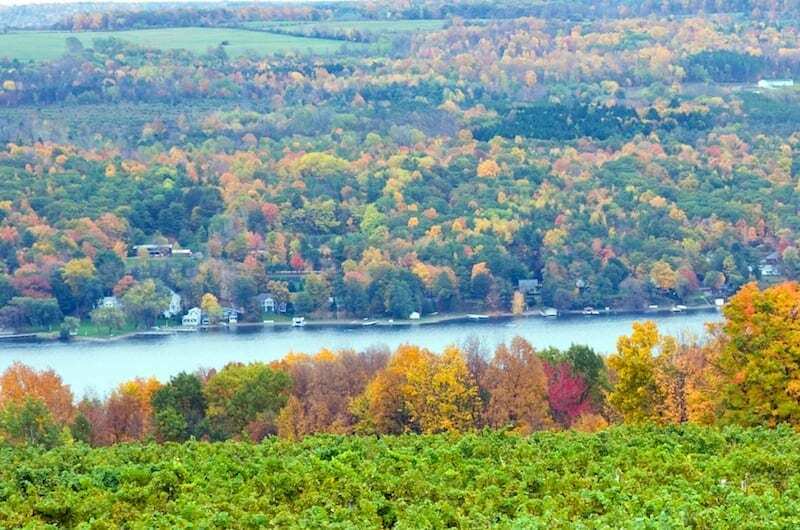 Need more on the Finger Lakes Wine Country? See Carpe Travel’s Finger Lakes Wine Travel Guide. The Farmhouse at Veritas is a six-room bed and breakfast adjacent to Veritas Vineyards and Winery in Afton, Virginia – the heart of the Monticello American Viticulture Area. Built in July of 1839, The Farmhouse stood as a family home for nearly 200 years when in 2012 it was opened to the public. Its elegance, simplicity, and comfort have withstood the test of time creating the firm foundation of quality and authenticity that the Farmhouse prides itself on today. Since opening its doors, guests near and far have had the opportunity to experience the down-to-earth luxury fostered in this region. 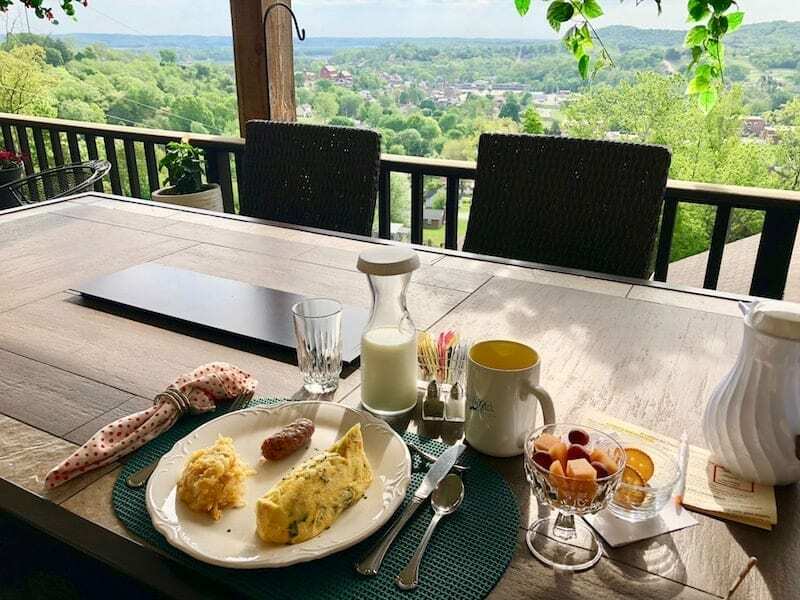 Every detail of The Farmhouse – from the well-appointed guest rooms to the farm-to-table, Chef prepared breakfasts and dinners – showcase the bounty of Nelson County’s food, scenery, and perhaps most importantly, its wine. The Glass House Winery Bed & Breakfast is one of the newer B&Bs in Virginia wine country. This five-room B&B all offer luxurious ensuite bathrooms and views overlooking the Glass House Winery and Vineyard as well as the Blue Ridge Mountains in the distance. 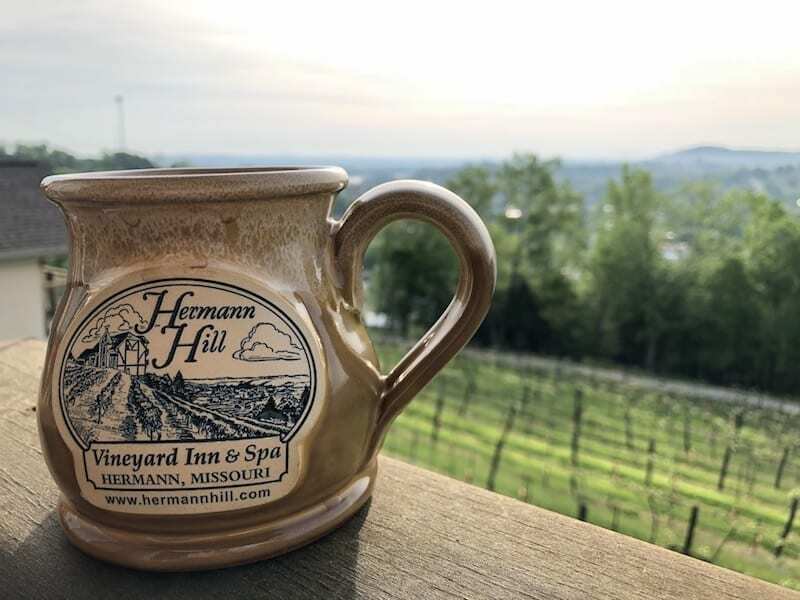 Located on top of a hill overlooking the town of Hermann in Missouri, Hermann Hill Vineyard and Inn offers an exquisite view of not only the quaint little town of Herman, but of the Missouri River and the surrounding vineyards, including those on its own property. Each room at Herman Hill include a full size working hot tub, private patio and a steam shower in the oversized, luxurious bathroom. Need more on the Missouri Wine Country? See Carpe Travel’s Missouri Wine Travel Guide. Having received multiple awards, The Villa Suites at Gervasi Vineyward is one to sip and stay at when you’re visiting Ohio. This Tuscan-Inspired Inn offers a variety of lodging options. The six Gervasi Villas are each comprised of four individual suites (24 suites). Guests have the option of reserving an individual suite or an entire Villa. 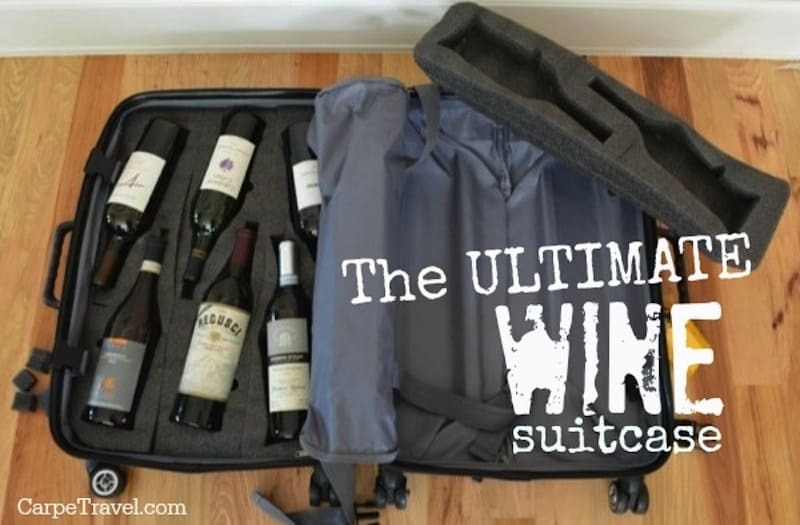 Talk about a great way to stay and sip with a group of friends (or a large family)! In addition to the Villas, the Gervasi Vineyard Farmhouse is also available for overnight stays and consists of four bedrooms, two bathrooms, living room, sitting room, study, dining room, full modern kitchen, and other features. The Inn offers guests a complimentary continental breakfast and several innovative dining opportunities, including one of USA Today’s 10 best winery restaurants, The Bistro. Located in the 1734 and 1815 wings of our beautiful manor house and in the surrounding cottages, the Inn at Grace Winery offers 15 distinct luxury accommodations, including seven private rooms in the Manor house as well as eight cottages scattered throughout the original outbuildings. This is a pet friendly winery hotel as well, pets are even welcomed with their own welcome basket! The Vineyard B&B at Lost Creek Ranch is an intimate and luxurious boutique B&B nestled in the Central Texas Hill Country, just 45 minutes west of Austin, minutes from Lyndon B. Johnson Lake and about a 30-minute drive to the popular wine trail, Wine Road 290. Each of the well-appointed rooms are named and decorated after popular wine varietal characteristics. For instance, the Shiraz Room is done is an eclectic style that will be appealing to many tastes while the Zinfandel Room furnishings are accented by spicy colors like orange and lime green to create a zesty ambiance. Pick your favorite varietal and pair it with your stay, or discover a new favorite varietal after sipping in the stunning views from your patio, overlooking the vineyard and vast miles of open hill country. Need more on the Texas Wine Country? See Carpe Travel’s Texas Wine Travel Guide. The Inn at Abeja is located on a 38-acre vineyard and includes a mix of guest accommodations that were originally outbuildings that have been restored to spacious individual guest rooms. The sprawling property also includes creeks, gardens, and lawns for guest to enjoy in addition to the vineyard and wine tasting option. Located in the heart of Temecula Wine Country and surrounded by 300 acres of mature vineyards and views of rolling hills, you’ll find the Ponte Vineyard Inn, the newest addition to the Pequot Winery. This 90-room boutique winery hotel offers elegant interiors, posh amenities, and a relaxing ambiance combined with fine dining and breathtaking vineyard views. South Coast Winery Resort & Spa is one of the top Temecula Wine Country hotels, known for providing guests with a relaxing vacation, wine tasting tours, and acclaimed dining experiences. Guests can lounge on the terrace of their private villa or hotel tower suite, surrounded by rolling vineyards for a delicious winery getaway experience. Auberge du Soleil is terraced along a sunlit hillside and nestled among a 33-acre olive grove, the “Inn of the Sun” is renowned for its culinary roots, sweeping vineyard views and exceptional service. It’s no wonder the hotel has become known as Napa Valley’s most iconic luxury property and named by Condé Nast Traveler editors’ #1 “Favorite Wine Country Hotel” ~Gold List 2018. Wine Country Inn is a boutique hotel smack in the middle of St. Helena, surrounded by miles of the world-famous vineyards of Napa Valley. Over 80 percent of the rooms at the Wine Country Inn provides stunning vineyard views, and there is also a winery house for tasting some of the best quality wines in the world. On the east side of Paso Robles, tucked away on 20 acres of vineyards and olive and fruit orchards, you’ll find Allegretto Vineyard Resort. Designed with Mediterranean architecture, lush gardens and vineyards for as far as the eye can see, Allegretto is the perfect wine country sanctuary. Every one of the 171 guestrooms at the Allegretto is European-inspired elegance with high ceilings, pillow-top mattresses, fine linens and luxurious amenities, to create a custom in-room experience. Each room features a balcony or patio opening to spanning garden and vineyard views. Leaving the resort to explore the surrounding wineries is optional when you stay at Allegretto. It’s easy to spend the day sipping on Allegretto’s own private label wine while lounging poolside in a private cabana. This is of course after you’ve spent time pampering yourself in the spa, and indulging on rustic northern Italian cuisine at Cello Ristorante & Bar. Renowned for crafting premium Bordeaux-style blends, JUSTIN Winery was named American Winery of the Year for 2015 by Wine Enthusiast. The winery is an exquisite destination unto itself with a luxurious three-suite Inn tucked behind the restaurant and tasting room, all surrounded by vineyards. A stay at The Inn includes breakfast delivered to your door and a winery tour and tasting, but don’t miss the restaurant’s five-course, farm-to-table, wine-pairing dinner. Afterwards, take a glass of wine outside to the concrete-and-glass gas fire pits lining the edge of the patio. The dark night skies above this quiet, remote vineyard turn out an expansive blaze of stars once the sun sets. This private Inn and winery is nestled in the rolling hills and vineyards of Paso Robles, yet it’s only about five miles from the historic downtown. Each of the seven guestrooms and suites at the CaliPaso Inn and Winery offer exquisite décor blending luxury and comfort. Features include fireplaces, private balconies or patios overlooking its vineyards and surrounding countryside. The Inn also offers the opportunity to stay in The Winemaker’s Cottage, an exclusive 1,500 square foot two-room suite, living room, full kitchen and dining room that can comfortably seat ten. A visit to the onsite tasting room is a must. The winery is known for Cuvee Blanc, Chardonnay, Tempranillo, Zinfandel, and its Estate Grown Cabernet Sauvignon. 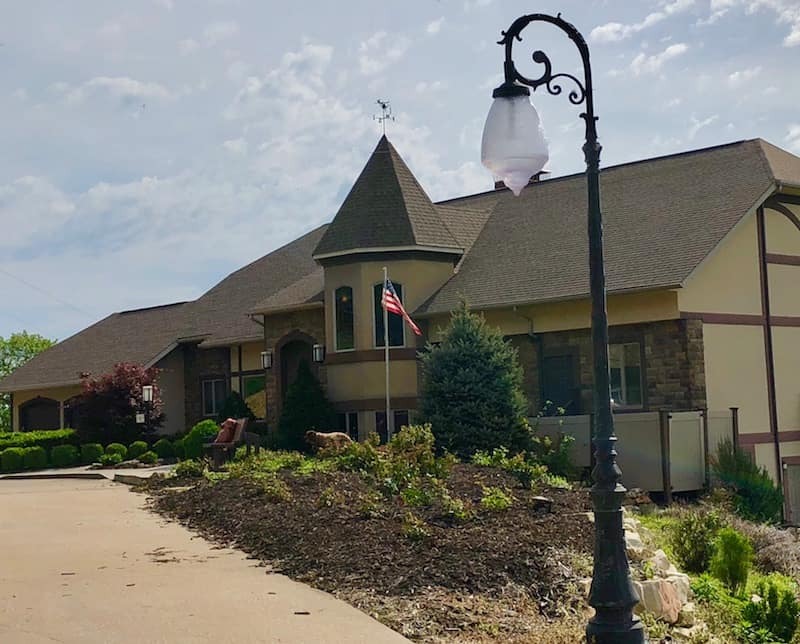 At the SummerWood Inn you’ll find an intimate feel of a bed and breakfast, yet with the amenities and concierge service of a luxurious retreat. The Inn sits on the grounds of the SummerWood Winery, which produces American Rhône and Bordeaux style wines. The nine-room Inn has a modern farmhouse design with a backdrop that sets the stage for a perfect wine country getaway. As a guest at the Inn, you will enjoy a farm fresh cooked-to-order breakfast each morning. When you return to the Inn each afternoon you can savor seasonally-inspired appetizers and delectable desserts perfectly paired with SummerWood wines. Located in Sonoma Wine Country’s fabled Valley of the Moon, Kenwood Inn & Spa is a hideaway offering a retreat to wine country for guests. Designed with serenity in mind, the Mediterranean-style Inn sits on more than two-and-a-half peaceful acres, surrounded by vineyards, orchards, and ancient oaks. The grounds are landscaped with greenery and flowers, three courtyards, a sparkling pool, two hot tubs and fountains. 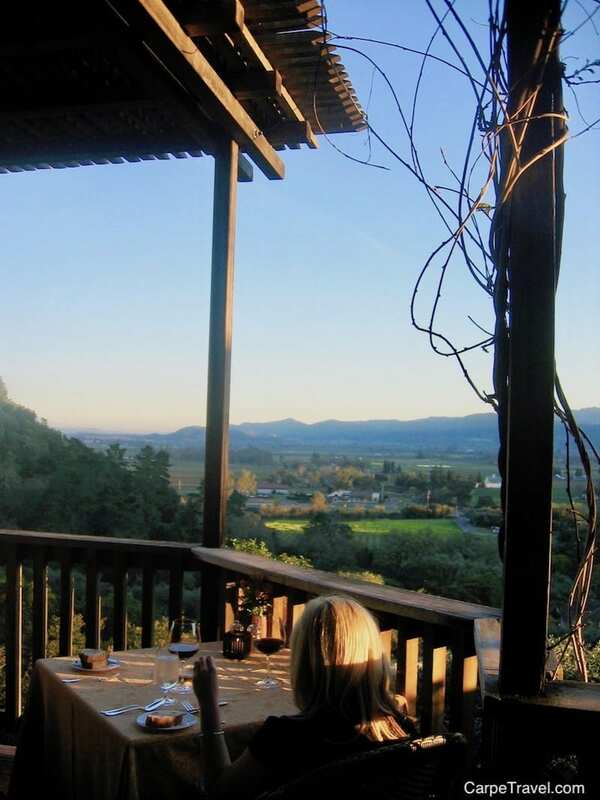 If you want to get away from it all and immerse yourself into a true vineyard setting, the Geyserville Inn is an excellent choice. Located among the picturesque vineyards of the Sonoma’s Alexander Valley, the Geyserville Inn provides a relaxing B&B setting with the elegance of a modern boutique hotel. 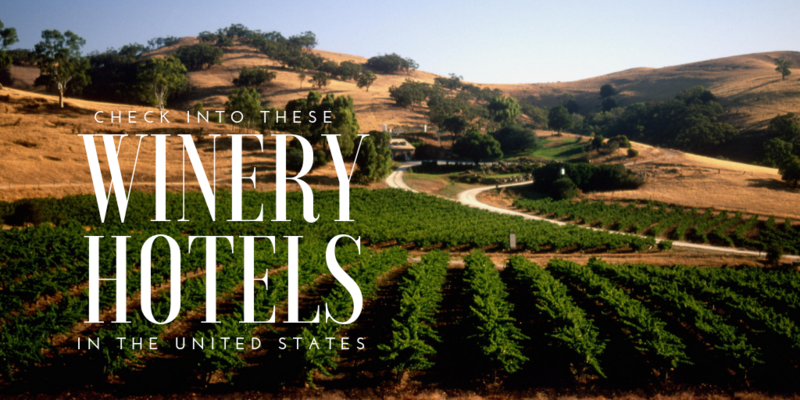 Need more wine country hotel recommendations? See all of Carpe Travel’s hotel reviews.